There are some situations that are difficult to handle and make a good save hard, however making saves is not just about stopping the ball. Working to control rebounds is a major part in reducing the number of shots you will face. Everyone plays differently (we’re all unique!) and how goalkeepers are taught varies according to coach and country (such as European and the styles within that, versus East Asian and so on), but one thing remains the same in the elite goalkeepers’ stances: they gloves are up and ready. Having the gloves forward is pretty universal at the elite levels, with the gloves out in front (although obviously held low can help with corners when diving, balance in kicking etc.). In Australia they seem to be more pro-active with an attacking, extended out ready stance, without making an overt generalisation! The ‘X stance’ has the gloves up and facing (with the legs also spread out to help react against wide shots and also able to close legs quickly for shots in that gap!). Regardless, it is recognised that raised hands are useful; especially important against quick released fast shots at glove height (where you don’t have much time to react, especially against internationals)! Moving with the face of the glove conjoins with the concept of attacking the ball. With your gloves already in front of you, it is easier to move out to attack the ball; you are already attacking the shot by being in front of it in the first place. Whether this is pushing out from a more inward , or turning and down from a raised and faced glove, you are still turning in and moving to face the shot, to get the most coverage with the surface area of the blocking glove. Or more simply, if they are in an attacking position (i.e. forward and out, already nearer to the ball and cutting the angle), like a baseball catcher would, moving and tracking with the glove, to stop, as the coach in the last clip by Australian hockey talks about and demonstrates. A sort of premeditated, precursory set-up with your gloves, where you are in a better position to react because you don’t have to bring your gloves up before making the save. By turning with the glove, than by reacting from a lowered position, you can effectively bring them into block more quickly and more efficiently. Instead of ‘waving’ or swatting with your gloves, and trying to push up for the save, you are in a better position. Obviously this is quite a technical case in point, and I can’t speak with reasoning on the depth of technical understanding for now, but this is still acknowledged as , and explained in the clip shown at the end. Facing and turning with the glove is quite revolutionary in some ways, I guess, because we have always been taught to do things differently and react. It’s one way of thinking and not everyone will agree, but you can see the evidence for yourself to consider it. Either way, turning the glove out and open for the save sees you in a position where you have to do less work because you are letting the gloves do the work. I think on shots wide of the body, it is a more grounded argument, than for attacking actively against those shouts closer to the body. Follow the footage of the following clip (ignore the training without arm pads if you prefer not to!) and notice how when the goalkeeper moves with the glove in a facing position, he is more successful with turning the gloves. This goalkeeper is practising this via working with a BOLA machine so everything is about repetition of shot stopping (to practise muscle memory if nothing else), he is on the same angle, in the same position, facing the same height of shot, but sometimes moves with the gloves properly, other times not. On the shots outside of the body, further away, I feel it’s because he is pushing out in an attack rather than turning out in a clockwise motion with the glove like a baseball catcher’s. This is what the Australian coach explains in a more detailed way how and why the approach works. Notice also, at the end, how he moves like this with his glove and is more successful (at about 1:18). Some more terrible illustrations (oops! ), but showing things might help with visualisation. 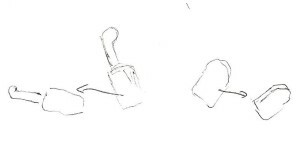 Here you can see the way gloves move and of turning in a clockwise motion with the glove already facing out, which should help to explain things. As opposed to pushing out in an attacking way, which is obviously different and better for shots nearer your gloves and body. 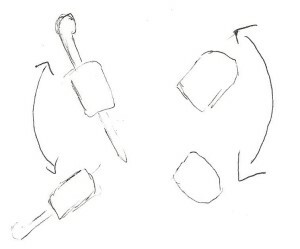 As gloves move out facing in a clockwise motion, they are already in a place to block; the glove is doing more of the work as you just move round in that clockwise motion. Attacking gloves see the glove pushed out explosively as you look to attack at shot nearer you, finding it difficult reaching out wide of the body. By making saves from a standing position, you need to be opening up with your body properly, in order for fluid movements for the saving motions. You can’t just expect to be rigid and upright in your stance if you need to move out with your hands to block. So you need to engage with your hips as you turn and push out. Whilst words can explain things to some extent (normally the lesser for some people; with the different styles of learning!) and we all learn in different ways, so getting things across visually will do more to explain things, as you can see it for yourself! And as this is the case, so this clip should do the explaining, with greater analysis by one of Australia’s well known GK coaches. As you watch the differences and analysis, there is a better job of explanation than I can manage right now! Ultimately, whether or not you want to turn with the glove all the time, it is definitely important to face with them. The more you face the ball with your gloves and the more you are active with them, obviously the better you are going to be with your shot stopping against glove high and wider shots! Rather than swiping at the ball, you are moving with the blocking face already covering to block, as you go. Think of how you show the glove to the shooter; turning it away shows less coverage and gives them more room to shoot into (visually and literally), but with your glove out and facing, this is not the case as you cover more. However, this is a write-up based on looking into the technique, rather than endorsing it totally (all I do agree with it!!). Purely to proffer some goalie education, to allow for thought and contemplation on technique, rather than arguing which is the most optimum way of doing things, especially if you haven’t seen the video yet! With a more controlled rebound and an easier push in to the motion, potentially, from a wider leg stance within what is often referred to as the ‘X stance’, it gives the goalkeeper a more technical approach to splitting across to save. Stereotypically speaking (over generalising is a bad idea, in any regard! ), it seems to be a trend that has developed in Australia (Stephen Mowlam seems to have been a driving force, or at least played a part in its recognition, using a wide stance that incorporated this aspect of saving with the legs, whilst still being able to ‘shut the barn doors’ quickly and efficiently!) and from there, along with others making it popular, it seems to have been absorbed into styles across the globe. 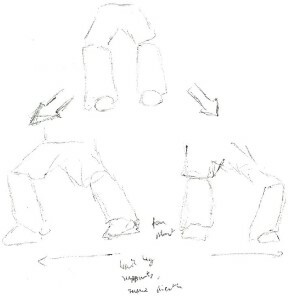 Kathleen Partridge, the former Australian international, who has produced the goalkeeping guide “Goalkeeping Skills and Drills” (a recommended read), wrote about the lunge as one of the technical aspects she covered in her book. Whilst it sounds a little unorthodox or a scrambling save, it’s not specifically a desperation save attempt. Instead, you are essentially just going a bit further than you can reach simply stopping shots with your pad or kicker from a standing position. Say you can reach so far by simply reacting from within your stance, but, with a lunge, you are going that extra distance with your push out with your leg. Obviously this requires a little bit of extra flexibility, which stretching and Yoga and that kind of thing can aid and help out with, but if you don’t have massive amounts of natural flexibility, you may prefer to stick to diving for those saves you cannot reach from your angle and positioning, with your stance, but it’s always worth giving it a go and trying out new things to see if they work for you (as mentioned in the ‘playing it your way’ article). Like the definition of lunge suggests, it’s a saving motion that involves a position where one leg is positioned forward with the knee bent and flat foot of that driven lunged leg, with the other leg positioned behind it. And also happens to be used with regards to fitness exercise and cross-training! It’s an explosive push to attack the ball and cut the angle wide of you. Unlike a more reactive, passive save where you simply respond to shots and turn your leg/foot to make the save from your ready stance, you are more so ‘aggressively’ pushing in to stop the ball. So, combined with the ’30 degrees’ and ‘attacking the ball’ saves, gives a greater option to push out and really attack shots that you are not otherwise able to reach from that reactive approach and stance; exploding out from the stance from the save. And this clip demonstrates it all quite well. 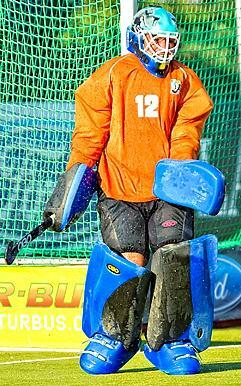 So, the goalie is young and teeny and tiny, but you get the idea from the way he is reacting to the shots! Essentially, you’re not moving with footwork to get behind and save, instead, you’re ‘staying put’ and planting and pushing out with the leg to get behind the ball to cover the angle and save. You should still be able to turn the kicker, as you normally would, during the save to help control the redirect and turn away the rebound to a safe area (where there are no attackers to poach it back, hopefully!). Balance remains the same, with you doing what you would in any standing save to keep the rebound down and controlled (I need to write a more in-depth explanation of this at some point!). Driving through and being explosive is important to getting distance on the rebound. Both feet plant as you push into the momentum, to help with staying upright. The back leg will also mirror the front to help in this regards. This is probably the worst sketch I could do (I’ll come back and change it when I have more time! ), but you get the rough idea of things (I think, or at least, hope!). Left leg is a better illustration of technique than the right!! When you lunge, you are driving out with your leg in extension in order to reach the ball with the increased surface area coverage of the kicker/pad versus rhp/stick or lhp with a dive. You are pushing out explosively to reach the ball as it comes at you (especially if facing elite level, fast paced shots for instance). It helps if you have good reflexes! 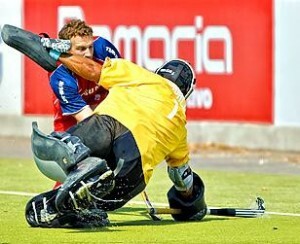 You want to be explosive and forceful, driving with power and precision and speed to make the save. But, more technically, when you push, you need to drive at it, keep your head up and over and then drive through, as you would with an attacking clearance say (keeping the foot down though!). Whereas a split, might see you drop awkwardly (going down with your upper half as you drop into the split leg position etc.) or lose balance slightly, theoretically a lunge, if done properly, should actually aid in balance and therefore provide a more controlled rebound and save. This is the added benefit of the way the lunge works and can be used. A lunge cannot go as far as a split (because you not positioning the leg out i.e. it’s not being pushed down and flat, out; it’s the foot that’s being pushed out) in full extension, but has the beneficial edge regards balancing. In any case, you want to have your head over, for the save, to ensure balance goes down through your body positioning, for a controlled save and rebound. When you push out and make the save, you ‘plant’ so that you get in the right position and help stay rooted and therefore balanced. This way, you can limit any issues with balancing. So, when ‘lunging’ to make a save, you also want to ‘plant’. Can’t go too far into this technically, as haven’t yet worked out the absolute specifics, but ‘planting’ is common with any leg/foot save from a standing position. You want to ‘plant’ as you explode and push out. In essence, the foot is the lead, and you are looking to stretch it out and then plant it down as you extend, to get behind the ball on the angle and make the save. But, it’s also important to ‘plant’ with the other stance to mirror weight and balance out. A planted back foot helps to strengthen your rootedness so you don’t tilt over either side as you drive out. Turning the foot in the direction of the lead leg should help retain balance as you don’t turn your other leg away from that angle. If you do, you’re half turned in the way you want and half not! So you are leaning wrong and turning your body away from the shot. But with both feet angled on that angle, you are ensuring you don’t turn away, even in the slightest, getting all of your body in positioning behind the shot. Driving with the hips, this is(another topic I want to cover at some point!). At 3:11 , notice how the goalkeeper slips, loses balance and falls back, thus taking them out of the ‘play’ and getting beaten. Instead, reinforcing balance with your back foot in a parallel with the angle of the driving foot, should help with balancing and ultimately making the save. The ‘lunge’ as a save is another ‘tool’ in the ‘toolkit’, a way of thinking espoused by a lot of ice hockey goalie coaches. In this sense, it gives you another option for your approach to save making and chance to play to your own personal strengths. But, it furthers the abilities of balancing within a splits style save. If you prefer to stand up on your feet and play a patient, responsive, upright game, it offers the chance to do so by extending out with the kicker for the save. Whereas a dive close to the body takes you out of the game, at least for a little while as you rush to get back up, a ‘lunge’ sort of cuts corners in getting back in the game for a consecutive save. Unlike a split, it is theoretically easier to recover from and also has the added benefit of a more controlled rebound, with your head over and rebound thus kept down and not bouncing up and away! On shots that are outside your angle and cannot be reached just by using your position, and angle, and reacting within your stance, you should be able to reach them lunging and attacking the ball in forceful extension. If you are comfortable with the eye-co-ordination with your feet and have strong footwork and flexibility, you may prefer this over diving nearer to the body, where you are still up on your foot, with an easier process of getting to the next shot, immediately ready for the next stop you face. Drag flicks are quite an important type of shot to face, with the speed and accuracy of elite masters of the art of drag flicking being a deadly thorn in the side of even the best goalkeepers. Greats like Taeke Taekema, Sohail Abbas and others on the international scene are reminders of how influential their talents are by scoring on the set play of a short corner through the specialist art of a well executed drag flick. However, that is not to say you should merely throw up your hands and accept defeat, saying great goal, if you want to really push your standards of goalkeeping! By learning to read the flick and how to react to it with quick reflex and athleticism, you can start to combat its deadliness, and make yourself more unbeatable. What makes the drag flick so special? The difference between a normal shot and a dragged ball is the way it reaches the net; a flick will push the ball up in a circular route, whereas a strike will knock the ball skyward along a raised diagonal line or a slap and hit across the floor of the pitch. With the drag flicker holding their stick far back behind the body and then pushing with force into the flick, the drive of the motion creates a massive momentum from which to raise the ball. The way the ball travels in this way makes it significantly harder for the goalkeeper to deal with, as it is harder to tell whether the ball will be pushed up really high into the upper echelons of the goal, or simply raised off the floor to make it difficult for the goalkeeper to stop it. The direction is often unknown, especially if the drag flicker is able to hide their intentions; when disguised, or pushed out to the side off the shaft of the stick, forcing the goalkeeper to react more to the flick, rather than being able to have a better idea of where the ball is headed. The ability to analyse where the ball is headed is also made more difficult by some drag flickers’ abilities to disguise their intentions. With the shoulder in front shielding the ball’s intended path and unorthodox techniques like Ashley Jackson’s, the goalkeeper has a harder time dealing with a drag flick. Combined with the speed of a strongly pushed flick, it becomes a deadly weapon for the opposition. As a result, you must have good, quick reflexes to react for the save (with the speed of the flick requiring you to be just as speedy with your reaction times) and properly watch the flight path all the way through into the save; reading the flick well, in order to stop it. Whereas you can play the percentages against a straight strike and go into a barrier to cover more against a low struck hit, you aren’t able to control the chances when faced with a drag flick, instead you have to be more proactive with your reads and reactions. By using your upright stance to readily cover more of the goal and having to react to the flick rather than exposing more room, you can still challenge the flicker. Dealing with drag flicks is more of a case of reacting at the right time, staying patient until the time is right to use your reflexes or athleticism to make the save. Working out where the ball is headed is more difficult when faced with a drag flick. Whereas it is easier to make an educated guess when facing a shot, the flick is more difficult to read. The important thing is not to over complicate things by guessing wrongly. By being aware of the opportunity to be scored on from any area, it is easier to combat the flick; moving into the save as the ball comes at you. With the drag flicker looking to expose available space, there is more of a chance of the flick going low where it is difficult to reach, or to the tops of the goal, in the corners. With an upright stance taking up more room, it is often easier to react from your standing position. If you like to make saves against flicks from a standing position, then raising your gloves to around the height of your shoulders, in front of you to react more easily as you push into the save, will help you react against a high flick around you and push into the save. Again, as I have written about before, focusing on the ball is incredibly important. From the injection to the save, you need to be totally focused; the more focused you are on the ball, the better chance you have of making the save as you are more set on its movements. 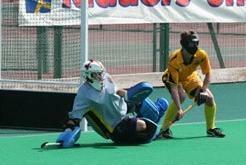 Watching the ball is so important to making the save against a drag flick. If you try to see the ball at the last minute, then you won’t have a chance at stopping the ball. Make sure you start focusing on the ball from the moment the shooter receives the pass from the injection, right through to the save itself. You need to keep concentration and keep your eyes locked on the ball; by concentrating on the ball, you will be able to successfully move your glove or pad into the right place to block. If you cannot reach the ball standing up or reach a low ball with your feet (although you may like to use the splits as an option to get to the ball, like Stockmann often does), then you are going to have to leave your foot to be able to make the save. The better your athleticism, the more readily you can deal with flicks acrobatically to make the save as you push out to reach high and wide (or low!) flicks. Diving high, wide, or low, improves your chances of getting behind the ball and turning it away. Knowing that the goalkeeper should be good enough to stop most flicks, at the higher levels, the flicker will really look to expose your potential weaknesses. A flick straight down the middle of the goal and between the legs should be a good scoring opportunity, with a goal definite if the goalkeeper stumbles with their footwork and opens gaps for the ball to go through, and if not, a rebound scoring chance if the save is made. Flicks around the gloves that are difficult to reach if they are close to the body, with indecision and crossing over of hands are also a problem area for the goalkeeper. When trying to stop a drag flick, goalkeepers can be the victim of going down too early, expecting a low flick and end up being beaten by a high flick instead. By not guessing or leaving your feet before the flick arrives and reacting on time, rather than too early, the goalkeeper has a better chance of making the save and stopping the ball. Being patient but also ready to act instantly when the destination is clear, is important to making the save. If you are faced with a drag flick for the first time, there is a chance that you won’t know what to do and be more inclined to ‘log’ anyway, putting you out of the game of save making entirely! When faced with a drag flick, there is also the problematic of going the wrong way and guessing which way the ball is headed, only as a result to be unable to reach the ball and end up conceding. The key to prevent this is again not to guess or try to predict where the ball will end up, but to react and focus on the ball’s flight, getting your timing right to be able to stop the incoming ball. Expecting the unexpected, instead of trying to second guess the situation, helps to prevent getting beaten! Being able to react on time is in itself an elite skill to have. It’s difficult to get a good read on flicks all the time, so being able to react to it as it approaches you is more important. Reacting appropriately is quite essential to being able to make the save. Not going too early and taking the bait of the drag flicker, in the sense that you may go the wrong, is essential. The better your reaction times and reflexes, the better you are being able to deal with fast drag flicks. Which is obviously why goalkeepers at the highest levels have remarkably fast reflexes, so it is no wonder why they are so quick, making last second saves, making use of their natural talents! 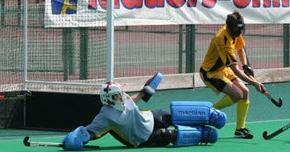 Staying upright and then reacting appropriately will help increase your chances of making the save. Whereas committing early can leave you looking silly, being patient and trusting your ability to react with your reflexes will obviously help you with potential problems of going too early. It’s something I’ve written about before and probably need to link to! The better your reflexes, the longer you may be able to leave it, theoretically, reacting at the last minute (figuratively!) to stop the ball as it finally reaches you. One way of proactively challenging the drag flicker, is to challenge with your positioning by having a higher ‘line’. Challenging the flick means you need to react quickly to it as it comes in, but forces your reflexes to do the work (theoretically!). I think by having to react you do not have time to over analyse or over think or get fooled into going the wrong way, being forced into going the direction of the ball as it comes in. ‘Quico’ Cortes (Spanish international, formerly at Egara and now Den Bosch), can be pretty good at this technique, challenging well and then reacting athletically to stop the flick. Not over challenging and not over doing will be better for you as it still gives you the chance to react. Alternatively, you may prefer to have a lower ‘line’ and rely more on your athleticism instead of cutting the angles. 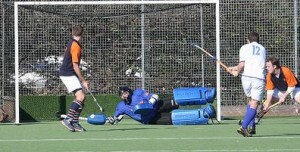 A modern trend in facing short corners, discussed before, is to play very deep within the D. Staying deep is a new technique used by a lot of goalkeepers at the international and Hoofdklasse level. You will now see a lot of goalkeepers at the top level staying very deep within their D, in order to give them more time to react to an extremely fast drag flick. If you watch Vogels, Stockman, Veering, Jenniskens or Blaak, they all stay deep in their D when facing a drag flick on the corner. They stand literally a foot off the goal line once they have stepped out of goal on the corner. This is because it gives them an advantage of having extra time to react against the flick. By being deeper, they have slightly longer. In comparison, if they were to be much further out, then they would have less time to react. By being deep in their D, it gives them longer to react (even if a millisecond extra!) to the flick; giving them the chance to watch the flight of the ball and get a better ‘read’ on the flick to move into the save as they see the ball into their equipment. However, this is at the risk of exposing and opening up more space to shoot into, as they are not challenging the angles. The cost of staying deep is at the disadvantage of giving more shooting space to look at, with the drag flicker able to see more of the goal. Whereas challenging angles and ‘playing big’ helps you cut down space, you are obviously exposing more space, leaving more room to flick into. So if you are going to play like this, you need to have good athleticism to extend into the save! Like any technique, it is good to practise facing drag flicks. The more you practise you get, the better you will be come game time as you will be confident in your ability to make the saves at short corners, whenever your team concedes them. Goalie coaches often use a lacrosse stick to copy the speed and accuracy of a drag flick. Obo’s training tool for drag flicks is useful because it can more easily replicate these qualities and is designed to make it harder to read, unlike the lacrosse stick. The best type of practise is to practise against the best! Training with good drag flickers is obviously going to help improve your ability to stop drag flicks. 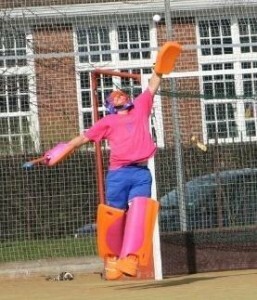 Try and find the best drag flicker in your club to train with, is an idea! Working on your reaction speeds and eye co-ordination in your spare time away from the pitch will also obviously be very useful in helping you when you have to face drag flicks. 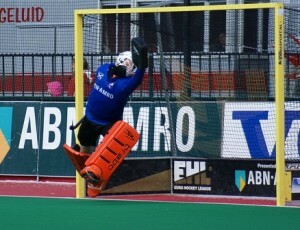 Diving high and wide is a key example of athleticism in field hockey goalkeeping. ‘High diving’ or dives where you leave your feet and jump diagonally into the save are a useful option when facing short corners where you need to push into and extend to reach a high ball wide of you. Based on your positioning for the corner defence, you may not have a man on the right post, which will mean you will have to be ready to push out in extension against a wide flick. The save technique could also be used when faced with tips and deflections where the ball is redirected high at goal, now more regular and difficult due to the new ‘own goal’ rule, with the opposition looking for a redirect from a ball smashed into the D.
It’s useful to watch football goalkeepers make similar saves as a way of following the correct procedure to make the save in a game (if you have no access to proper coaching etc.). Without having an illustrative example, it’s difficult to explain! Plymetric exercises and leg strengthening should also help to improve your reach and power as you push off with momentum. Copying football drills and exercises should be a helpful way of learning the process. There is a specific drill starting off with catching the ball on the ground, then making it higher and higher until the goalkeeper is high diving, in order to build up the practising goalkeeper’s confidence, but cannot find evidence to place it in this article unfortunately. Short corners are the main scenario where you will have to make such saves. A lot of corner defence set-ups do not have a man on the right post, since the defender comes off the post to protect against the slip pass to the injector coming in for a deflection. With more room to cover, the goalkeeper has to be ready to defend more of his goal wide to the right. With the drag flicker looking to take advantage of and exploit the extra room to the side of the goalkeeper, you may find yourself having to extend for the save. With the speed and height of drag flicks, it is harder for the goalkeeper to move across from a standing position for the save, so high diving gives them the extra reach needed to make the save. Thus, high diving and use of athleticism becomes incredibly useful. Lobs can be a tricky thing to deal with; here’s how to stop them. The lob is a useful tactic for the opposition; trying to catch the goalkeeper off their line to beat them with an overhead flick. Although not the most regular form of shot, they are still tricky to deal with, and the goalkeeper needs to be aware of and know how to properly deal with such scoring opportunities. Being lobbed can often be an embarrassing experience if you fail to beat it, so you will want to do your best to keep the ball out of the goal! The main cause for being lobbed is being too far off your line. Seeing the open space to exploit, the shooter will look to try and lift the ball over you, since you will not be able to . Caught out and unable to get back, you can end up being embarrassed by a well taken lob. If you have come out early to meet the shot, then the attacker, if they are skilled enough, can lob you; putting you in a tricky spot as you have an ‘open net’ behind you. Being positioned deep within the D in the first place helps reduce the chances of being lobbed, and also making your life easier if you have to face being lobbed. Playing deep, not far off your line means you are already set in a good position to be able to block the incoming lob. The closer you are to the lob, the easier it is to cover it. In order to get there quickly enough to be in place to cover the lob, you will have to move with speed, backing up against the shot to be able to block it in time. Back step as quickly as possible, maintaining your balance, to get back to cover in time. In soccer, goalkeepers will turn side-on as they step back against the lob. The reason for this is that you will face the ball more as it drops. 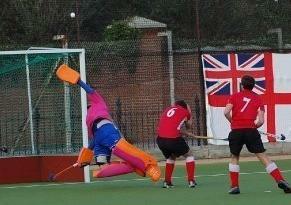 By turning sideways, you too can gain an advantage against the lob, allowing you to make the save successfully. Jumping up against the lob, you need to leap up into reach the ball. Make sure you are explosive; exploding from your stance up into the save to be able to reach the ball. When making the save, it is important to get rid of the rebound, so you don’t make a ‘dangerous ball’ or give away an easy chance to tap the ball into the goal. Use the technique of tipping the ball over the bar to get the ball away from danger, just like soccer keepers do. Get under the ball and palm it up and over; a push into the ball will put it away with greater velocity. 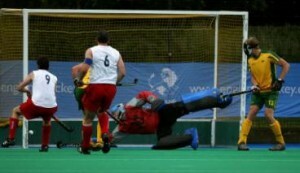 If it is not possible to reach into the save, then you will have to try and reach back against the shot to make the save. With the speed of the ball, you can easily get caught out. Drag flicks during short corners are the other time when you will see a lob attempt, and it is easy enough to get caught out, having stepped off your line to challenge the angles. With yourself already beaten, you will have to reach back against the play to try and block it; cutting off its path. Against a lob, it is more necessary to ‘keep it safe’ given the danger of allowing an easy goal. It is important to ‘make sure’, checking that you have it covered, so that you don’t give away the goal. The flight of the ball can be deceiving, so if you don’t watch it through, you may end up being made to look silly. 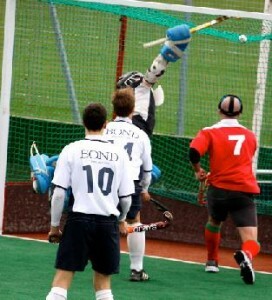 Notice how the ball has hit the top of the netting, but the goalkeeper still ‘makes sure’. Another useful to learn from ‘soccer’ (football), is how to deal with this situation. The model for dealing with a lob is based on soccer goalkeeping technique, so learning about the way soccer keepers play can only improve your ability to make such a save. Goalkeepers in this sport often face lobs, having to regularly stay deep and reach up against high shots to block. By watching soccer (which is easy in soccer mad countries) you should be able to pick up a thing or two. Reading guides on is also a good way of learning. Having friends who play goal in soccer is also very useful, as you can pick up a few ideas on how to deal with lobs, when being faced with them in hockey. “Logging” is still an important save selection at the short corner, even if drag flicks are becoming more prominent at the high levels of the game. The goalkeeper should be going down on a straight strike at goal, so that they can get behind the shot. Here’s how to ‘lie down’ on the shot. Logging is the idea of setting up before the low shot before it’s taken, taking the educated guess or expectation that it will go low. With the rules stating that the ball cannot be lifted above the backboard, on the first shot taken outside the D, at a short corner, the intelligent and crafty goalkeepers used this to their own advantage, lying down in preparation for the shot, which the shooter would bite at the opportunity to fire at them. Logging, or going into a lying horizontal barrier, in comparison to diving down, involves the goalkeeper going down before the shot is taken; allowing you to block off the bottom of the net, playing the percentages to deny a goal through you. The log is a technique used specifically for the low, straight strike faced on penalty corners; it doesn’t work at any other time in the game, as a player could easily lift the ball over you and it would take too long to get back up from! On short corners, you can play the shooter’s options and make the choice based on percentages to cover the low shot; covering as much of the bottom of the net as possible by lying down against the hit. Although keepers have to be more creative with the move now as shooters favour the disguised and ruthless drag flick, it is still useful at covering a large amount of net by lying horizontally in front of goal, when faced with a straight strike at goal. On low shots, the goalkeeper is normally encouraged to ‘lie down’ against the incoming shot, taking away the low portion of the net that the shooter is looking for. By making full use of their equipment, the goalkeeper can reduce the scoring chances of the opposing players from scoring from a direct low shot at goal. Rather than standing up for a shot, going down onto the pitch allows you to create a horizontal barrier against the incoming shot, maximising your body shape to cover the goal and take away a significant amount of shooting space, to deny the shooter on a low strike aimed on goal. Time is obviously needed to get down in readiness, so you should consider when it is best to use the move; going down with the strike so that you make the save properly. To make the log easier to understand and use in a game, it’s best to break it up into stages. This way, it makes it easier to copy when using the move in a game, as well as speeding up the process during play. As you move up the tiers of hockey, you will need to improve on your technique so that you can go down quickly when you need to (rather than going down before the shot and having the ball playing around you to be scored on). Quicker routines will mean that you have less time to get down. For the barrier save to be successful, you need to be able to get down quickly enough according to the situation. To really force yourself down into the shape quickly, you need to drive down with momentum; forcing yourself onto the floor quickly. Practising the technique repeatedly will help you improve on the technique and timing the move (try to practise it when your team are practising short corners at training). Down on the play, you are left between a ‘rock and a hard place’; having limited time to recover into your ready stance in readiness for the next save. Working out what to do next and deciding on when to recover, will affect the future outcome of the situation. Now that you’ve made the low save (like a dive, or have purposefully gone down to block with a barrier) the hardest thing to deal with is getting back up and recovering in time for the secondary save. Similarly, if you end up on your back, after making a scrambled save, moving across goal, and end up losing your balance, then your situation is made even more tricky by the need to get strong in your stance within the time allowed to recover. The burning question on your mind, is what to do next; unsure whether to cover shooting space, or take yourself out of the play for a recovery. Do you make the effort to get back up and try to get set? Or do you attempt to make a desperation save against the rebound shot? With the ball potentially coming straight back into play, you have to have your wits about you; aware of what is going on around you, and able to make a dramatic reflex save if required. Your defenders can be extremely helpful in getting the ball out of the zone as the shooters attempt to score on the rebound, and you need to work with them, as well as communicating the dangers they aren’t attentive to. Barrier saves are hard to recover from, even without the need for quickness; along with getting up from a save where you have ended up on the pitch. As with all saves, the best recovery is reversing how you made the movement in the first place; pushing up off the stick, getting up on your feet and then going back to your normal stance. When pushing, make sure you get as much power as possible in order to get up in one go, otherwise you will struggle and waste precious time or get stranded. Keep your eyes on the ball at all times, so you are aware of where it is and whether another shot is coming your way or not. You can keep your glove out in front of you at all times in case of a shot, which you can stop with the glove. As you get better and stronger from practise, you can eliminate getting up off the knee and get up in a single motion instead. As the goalkeeper facing the shots, it is important to come to your own conclusions about when to recover in time; if you recover too early you may leave yourself vulnerable, whereas if you stay down for too long, you will leave yourself open to lifted shots. Depending on how the play is developing, and your confidence in your own recovery speeds, you should recover for the next shot as it develops. When you recover depends on the situation and how the play has developed. If you can recover and it is best to do so, then get back up quickly, otherwise stay down and get ready to block another shot! Sometimes the only thing you can do against the shot is to stay down. You don’t have enough time to recover, so the best thing is to remain down, allowing you to cover the low shot. You can attempt to get in the way of rebound opportunities, using your body to cover the shooting space, even putting your hand in front of the shot to cover more space. Rolling over onto your back can help you cover low on-pitch strikes using the snow angel desperation technique as explained later on. The shooter’s priority here is to get the ball over or through you as quickly as possible. You can bank on their nervousness and desire to get the shot off as soon as possible, simply shooting straight into you. Some of us are blessed with good defenders who know our style of play and decision making in dealing with shots. By staying down on the play and letting our defenders deal with clearing the rebound, we can increase coverage of the bottom of the net, in case the attackers try to lift the ball or shoot at your prone frame as they attempt to get the ball out of the D.
You will generally not have time to recover, so letting your defenders do the job for you will help you in dealing with the situation. 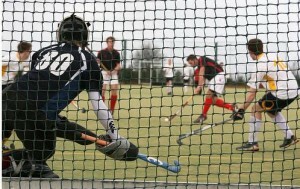 Diving stick side is the most obvious example of an athletic goalkeeper, with the goalie extended out low to the stick side to stop the ball along the ground. This is the most basic dive, the one websites or team training session leaders preached to you about. It’s the simplest, and the most obvious; it generally implies diving to the right with your stick. Diving stick side allows you to reach out to low shots that go past you on your right side, on shots that are often out of reach. Make sure you follow through with the saving motion; watching the ball into the save to ensure that you make full contact with your stick to stop the ball getting past you. Stay low throughout the dive to cover the shot. When executing the save, slide the stick out and along the ground to control the dive. If the ball is still out of reach, you can extend your stick out to get distance on the save. You can angle the stick towards the back line to direct the ball to safety. Avoid landing on the elbow, which will otherwise get easily damaged after continually diving onto it. Instead, try to land on your forearm (the front of the arm – elbow to wrist); pushing out with your arm to drop there. A lot of goalkeepers, like the school of North American goalkeeping, prefer to have a stance where the body provides a constant blocking shape, keeping a tight stance during all of the play, with the closed legs providing a vertical barrier against possible shots, without any chance of the ball squeezing through. With the body always in this shape, there is no need to push the pads together immediately, when a shot occurs. Although a lot of coaches, especially women’s hockey in Australia teach the block as a save in itself, you should see it only as a means to block off the ball when the shot is headed between your legs. 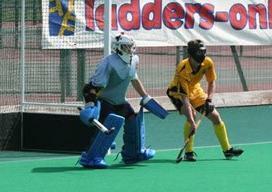 By making use of a narrow stance, with the pads locked together, there is no chance of the ball getting through you. Although movement is harder, this is good for beginners who are unsure about their abilities on point shots. In game play, this is especially useful against tips and screens where the opposition will be looking to squeeze one through you via a point deflection. To prevent shots getting through the gap between your pads, you can close them together, thus closing off the possible gap. Whilst this is not encouraged in most situations, as a suitable level of hand-eye co-ordination and understanding of the game will allow, there are times when it should be utilised on one-on-one opportunities, and tips and screens, where the shooters are specifically going for the gaps between your legs. When challenging out against a close-in shot, you can charge out with pads closed to provide a blocking shape; playing the percentages to cover shooting space. However, you will still see a lot of keepers from all over the world, beginner to pro using it properly to close gaps, but remember: you should not see the block as a method of leg saves: the leg is used on shots to the sides within the ready stance to cover the raised shot. Instead, it is an efficient way of closing off the hole between the legs. On plays where the goalkeeper is moving across against a pass, or moving attackers, it is possible to leave an open gap between the pads, with a wider stance, causing an extremely embarrassing ball as the shooter squeaks the ball through the open pads. By closing the legs against the shot, the goalkeeper is able to close off the available space and vastly reduce the shooter’s scoring chances.